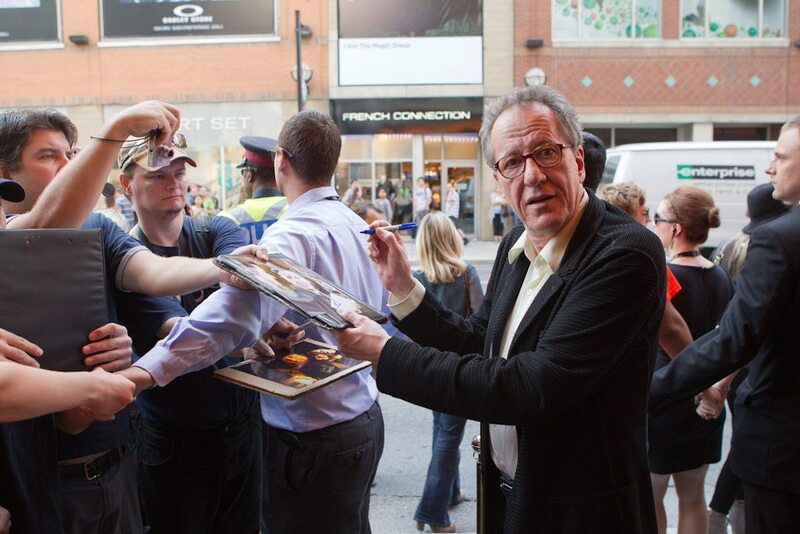 Geoffrey Rush at the premiere of Eye of the Storm on Sunday night. Director Fred Schepisi (on the left) joins the stars. A couple of hours later, much screaming for Michael Fassbender at the opening of Shame. Film honcho Ivan Reitman brought his daughter. Also on Sunday, the opening of The Deep Blue Sea starring Rachel Weisz. She was joined by co-star Tom Hiddleston. ...the first red carpet kiss of the fest. …the first red carpet kiss of the fest. On Monday, fans gathered in the hot sun to wait for the Material Girl herself, Madonna. Apparently this produced a great deal of anxiety. In which a reporter tries to get fans to sing their favourite Madonna song. It went about as well as you'd expect. In which a reporter tries to get fans to sing their favourite Madonna song. It went about as well as you’d expect. This fan really didn't like the song. This fan really didn’t like the song. Madonna was here for the opening of W.E., starring Abbie Cornish. Co-star Andrea Riseborough was also in town. Finally, we ended the night with The Lady at Roy Thomson Hall, directed by Luc Besson. The film tells the story of pro-democracy activist Aung San Suu Kyi, and many of the fans who came out last were bearing political messages. Michelle Yeoh, who plays Suu Kyi, spent some time listening to their concerns. TIFF does not give up. In fact, TIFF keeps on going. You know who else keeps on going? Madonna, who is still doing new things. In this case, writing and producing a movie about British royalty. W.E. had its festival opening last night, followed by a very different kind of film, one about pro-democracy activist Aung San Suu Kyi. “I’m originally from Detroit so I’m practically a Canadian,” Madonna said—as though the fans needed any inducement to love her harder. Those fans were later replaced by others with a more activist bent, Burmese pro-democracy supporters out showing their thanks for The Lady, which helps call attention to their cause.